Your skin is constantly compromised by pollution, radiation and allergens. These irritants lead to inflammation and poor cell function, the root causes of ageing. You can repair and prevent harmful cellular changes caused by these environmental toxins with Intrinsic Youth Technology. Your skin intrinsically has the ability to function like it did 10 years ago, it just need to be reprogrammed. Our Intrinsic Youth Technology also utilises a revolutionary probiotic formula to support the skin’s microbiome through cell proliferation, barrier recovery and stimulating the skin’s own bacterial defences. Promotes healthy skin on the outside, as well as on the inside. This range has also been proven very effective for male grooming routines – helping with shaving rash, reducing redness and wrinkles. For more information or to book a demo workshop please contact me. Our skin cells were designed to be luminous whatever age we are. Trulum concentrates (uniquely) on the Microbiome of the skin and re-programmes the skin to behave the way it did when we were younger. To fix the surface and the look of our skin, we need to go down through the different layers of the skin. The ‘Epidermis’ is the first and top layer of the skin and is the first line of defence. The second layer, the ‘Dermis’ is responsible for elastin, collagen and plumpness. The ‘Hypodermis’, the third and bottom layer of the skin is the foundation of the skin which is where capillary function happens, and is targeted towards the cardiovascular system. So – How does Trulum skincare work? Trulum Cleansing Gel supports probiotic technology to support the thickness of skin, cleaning the skin without stripping good bacteria and with a moisturising and firming effect. Trulum does not strip the skin of important lipids but it effectively removes makeup, toxins and supports healthy exfoliation. It is completely suitable for multiple skin types. Trulum Hydrating Toner not only replaces and restores the proper PH of the skin, it also rehydrates and purifies. There is a moisturiser in the toner also which makes it really lovely to use. Trulum Brightening Serum evens the skin tone and goes right down to the Basal layer of the skin, looking for age spots to stop them raising to the surface. It also increases exfoliation and dramatically reduces any roughness in the skin, making the skin luminous. Trulum Youth Serum with probiotic technology is extremely powerful because of the delivery system. As we age, Fibroblasts slow down and we don’t produce as much collagen. Youth Serum produces something called ‘Collagen type 3’ which builds collagen and elastin in all levels. 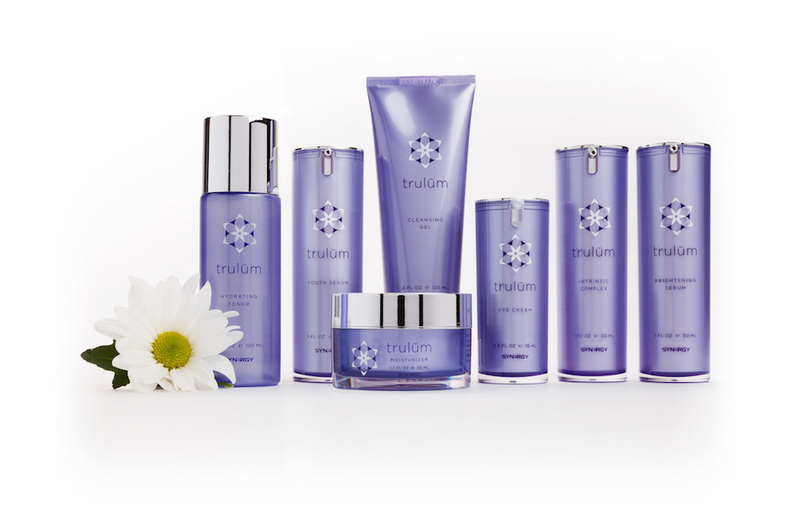 Trulum Intrinsic Complex gives the skin it’s strength. Our skin is on a time clock when exposed to UV radiation, which tears apart the DNA in our skin. If you can’t repair damaged DNA it can become a cancer spot. We have a short amount of time to repair it. With the Intrinsic Complex the DNA is literally removed, repaired and put back into our skin. A second enzyme is added to the Intrinsic Complex which works on the Mitochondria – so repairs the DNA of the cell and the Mitochondria. Trulum Moisturiser is such a lovely product to use. It goes into the skin and stimulates the skin’s moisture production, working from the inside out to work on the lipid bilayer. It has been proven to increase skin hydration by 88% in 30 minutes! Trulum Eye Cream – the eyes are the most sensitive and tender area of skin on the whole body. The skin around the eyes does not have pores and it’s often the area which shows the first signs of wrinkles and lines. Trulum Eye Cream gives instant skin plumping, increases collagen production and reduces the area of wrinkles and crow’s feet lines. Dark circles fade and wrinkles literally smooth out. It can also be used for spot treatments on other areas of the face, for example, the lines which often form around the mouth.